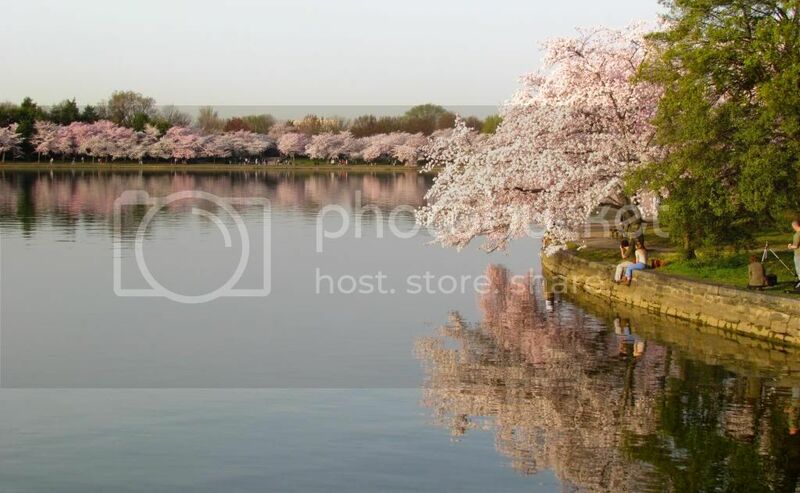 I did something completely average on Tuesday morning – I joined thousands of other Washingtonians and DC Tourists and headed down to the Tidal Basin in hopes of catching peak Cherry Tree Blossoms. What I hope isn’t so average are the pictures I managed to take. 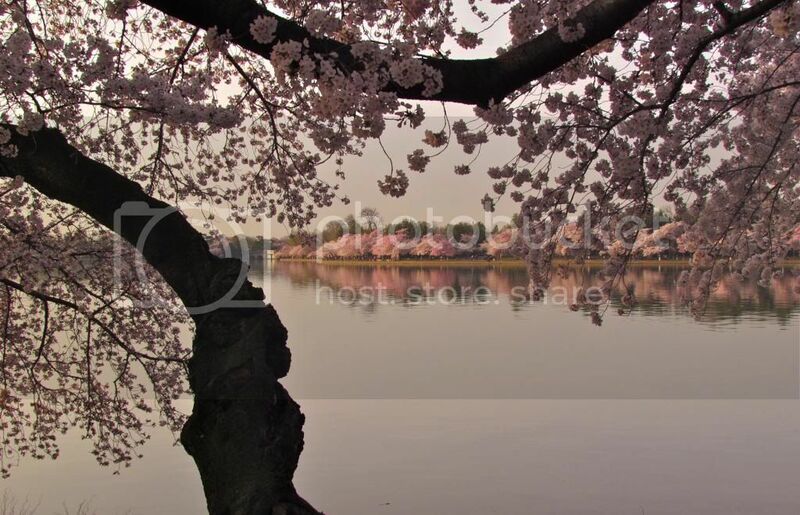 If you’ve never had the chance to walk the Tidal Basin at Cherry Blossom time, then here’s your chance now… come walk with me! My mom and I arrived at about 6am, barely finding one of the last parking places. The sky was just turning the prettiest color pink, getting ready for the theme of the day. The sky faded as the sun rose higher then touched the water and horizon with a surreal pink glow. With the sun came joggers! 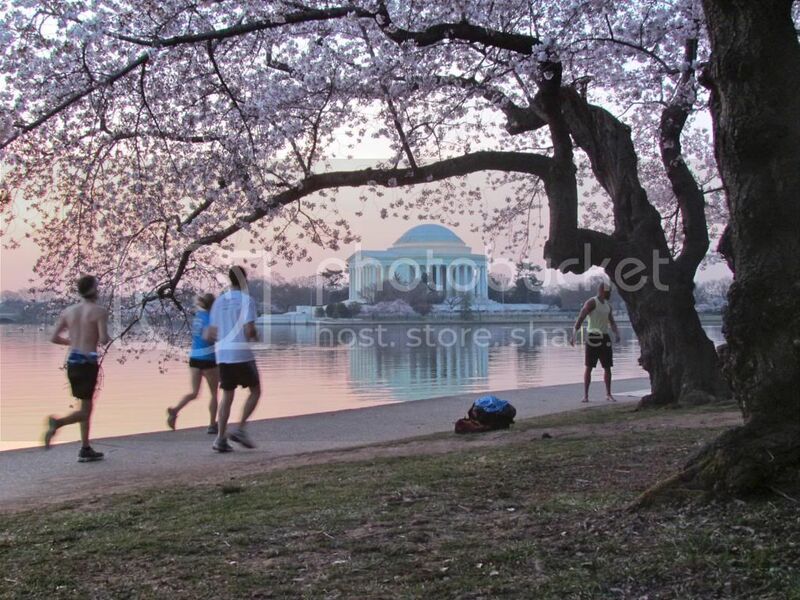 We started walking towards the MLK Memorial before the sun was fully up. Though it was tough to get shots without people, it wasn’t impossible to find good views in between runners and other photographers. And the sun arrives! 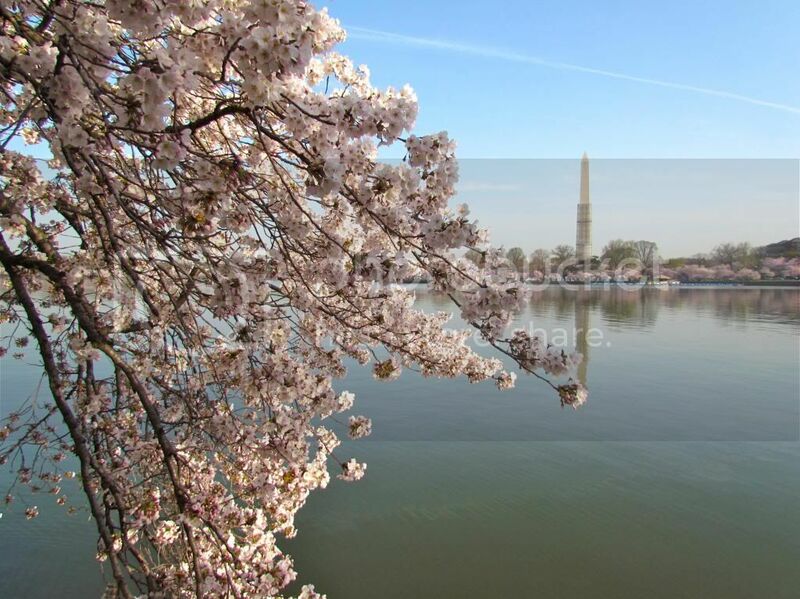 Cherry blossoms are about to take on a whole new appearance. 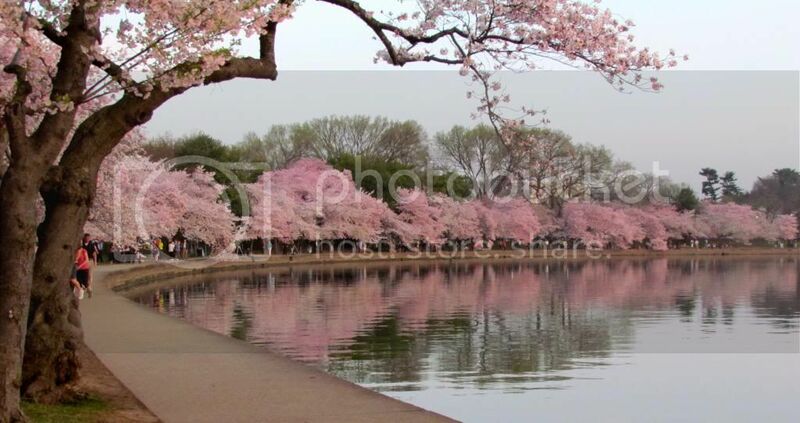 With the sun came the glorious pinks at the far end of the Tidal Basin. We’re in between the FDR and MLK Memorials. 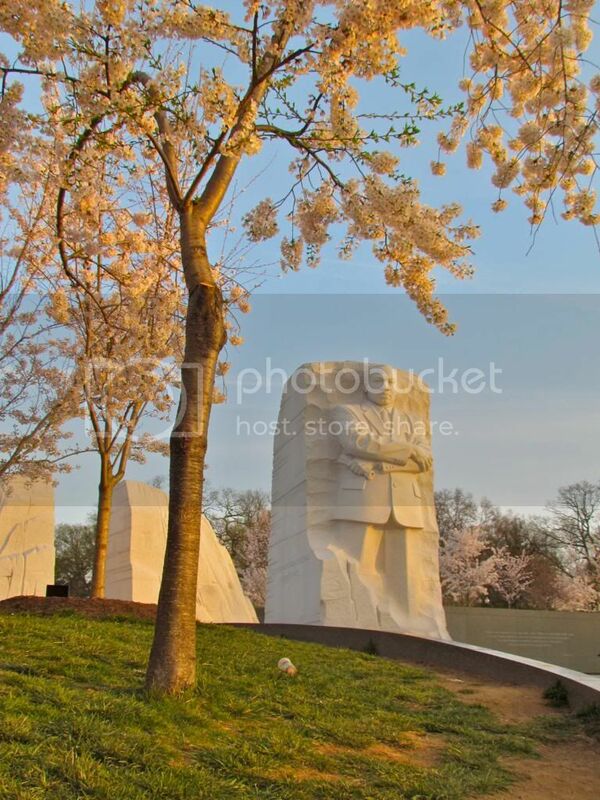 MLK was bathed in golden light as were the white cherry blossoms standing guard nearby. A little further around the bend and we’re looking back at where we started. The sun has yet to warm this part of the path. 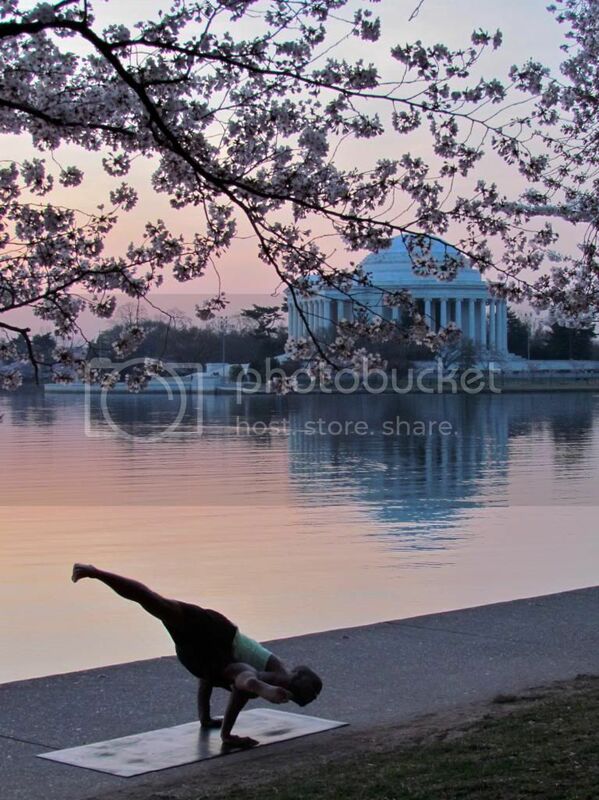 Cement, delicate cherry blossoms, and gorgeous green lawn. A stunning contrast between man-made and the natural beauty. 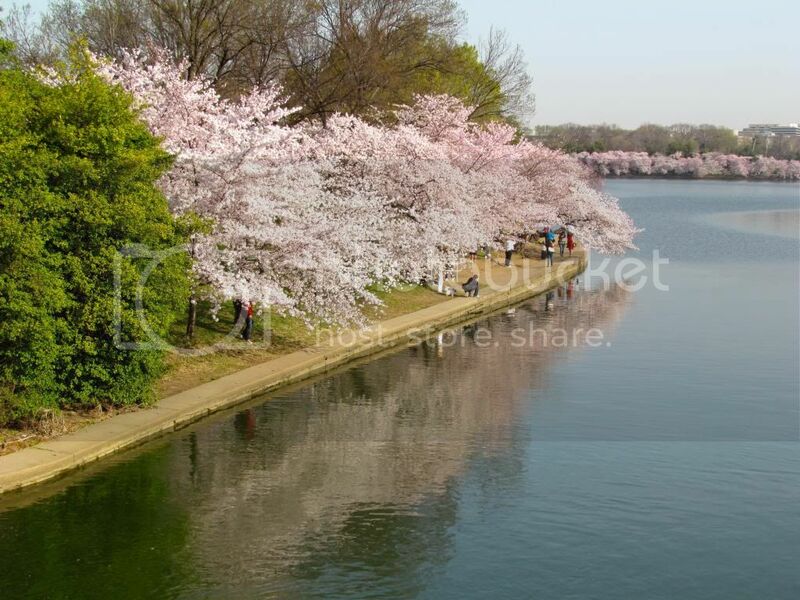 Taken from the bridge overlooking the Tidal Basin. I only wish I knew the young couple so I could send them a copy! Looking back on the path – you can almost feel them opening even more fully as the sun rises higher in the sky. 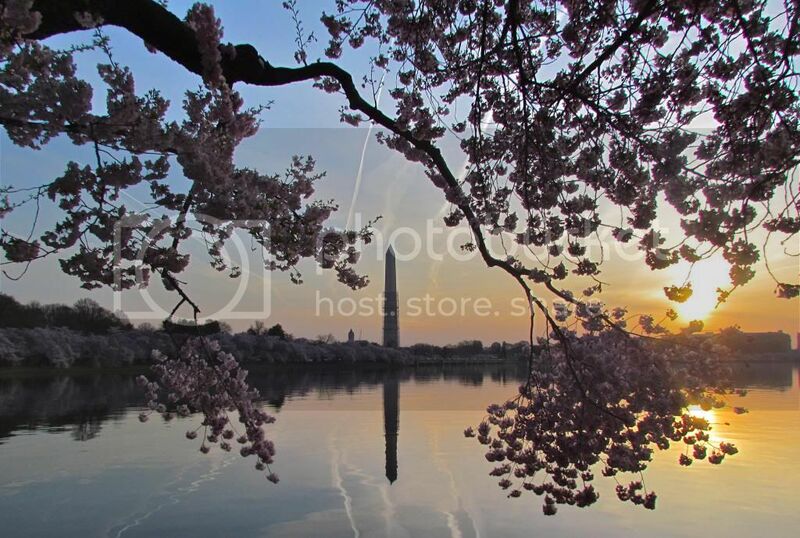 The combination of Monument and Blossoms never failed to attract my camera lens. Every tree offered a new shot. 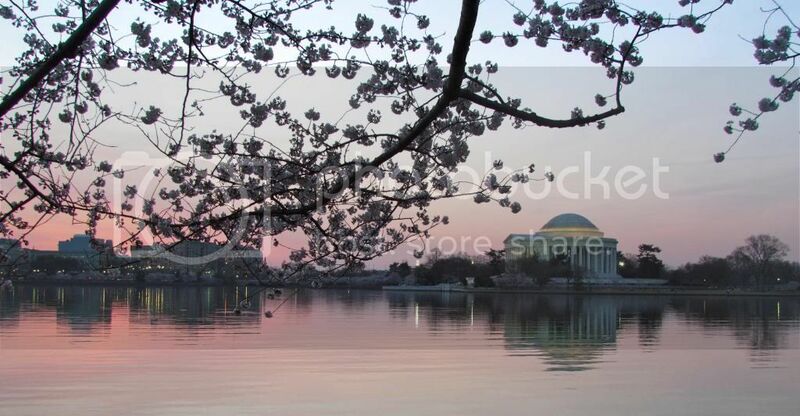 This is taken as we’re approaching the Jefferson Memorial. Pictures from this year will be unique because of the scaffolding on the Washington Monument. Taken from across the water. I love that the MLK monument changes from a distance – the man becoming one with the mountain. Full circle – looking down on the trail where we started at dawn – 2.5 hours later. Almost 300 pictures taken. I just love digital technology. I would love to know your favorite picture. Please leave a comment below or visit the Facebook page and leave a comment there! 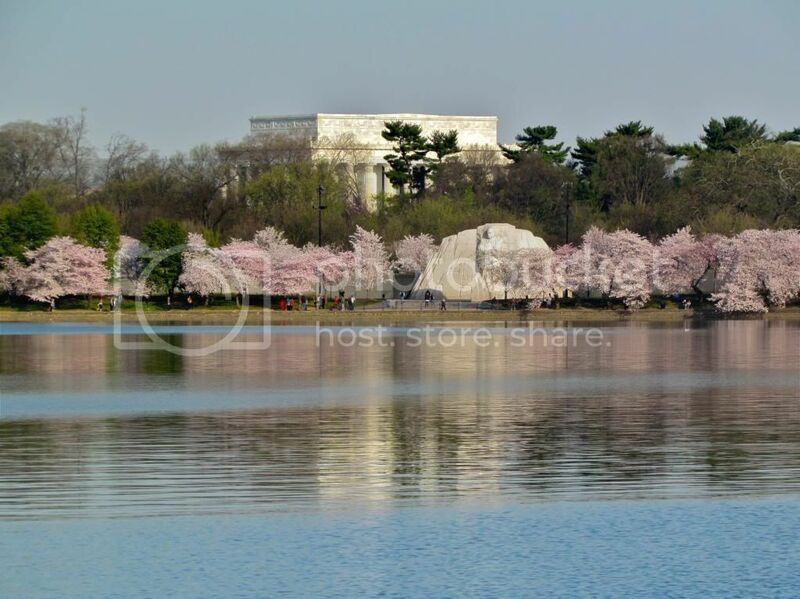 Wow, this is such a beautiful walk to have had the chance to do!! Lovely photos!! Great pictures, Ang. 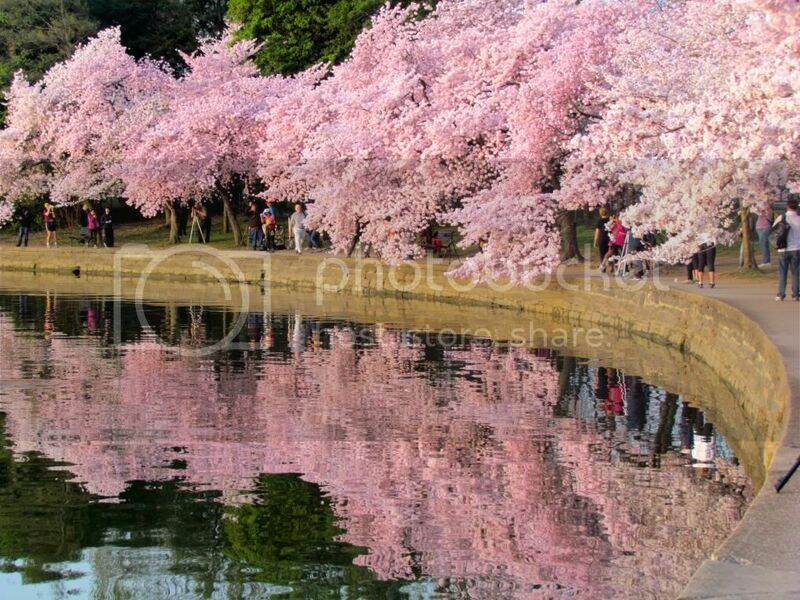 I remember the lovely blossoms and try to forget the crowds. In Japan they spread out blankets and get drunk under the trees. We saw people spreading out a breakfast feast in the early morning hours. If I wasn’t so intent on taking photos, I could imagine preparing a picnic breakfast and actually enjoying it but I’m not sure I would have the patience to sit in one place. 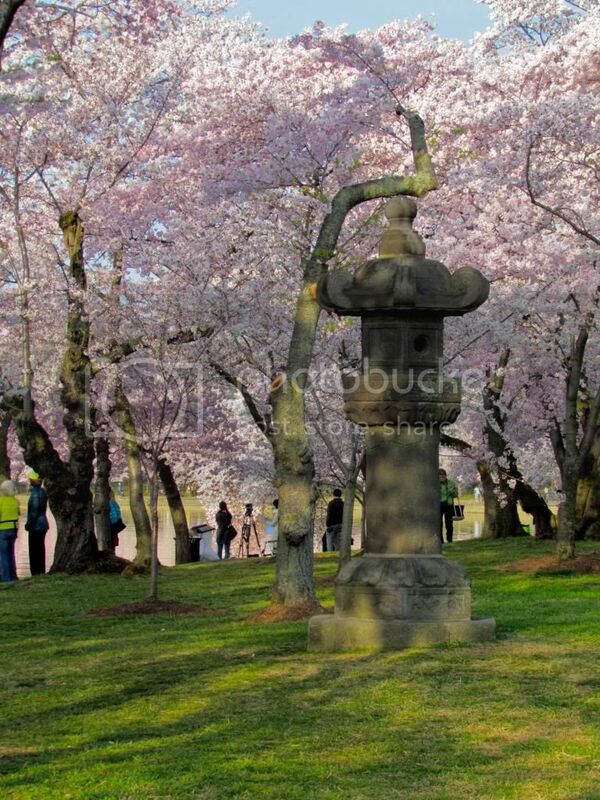 I want to pop all around and see the blossoms from so many different directions. Sitting still just doesn’t fit in the equation! Numbering the photos would be good too. No, I have never done one but entering ‘WordPress poll’ into Google seems to bring up a lot of ideas. If you edit a page then do ‘Appearance’ > Widgets > there are a couple of widgets that may help. They are called ‘Top Posts and Pages’ and ‘Top rated’. Not a poll, but may help. Thanks, I’ll take a peek. It would be worth it for the next set of photos I think. I like the 12th photo up from the bottom the best. I need to figure out how to do a poll on WordPress! Do you have any clue?